One of the main activities of the Observatoire Satellital des Forêts d'Afrique Centrale (OSFAC) is capacity building in the use of satellite data and mapping techniques for the sustainable management of natural resources. Each year, OSFAC organizes training in Geographic Information System (GIS) and Remote Sensing using the following softwares: ArcView, ArcGIS, Envi, Erdas, QGIS, Dnrgarmin, Oziexplorer, etc. 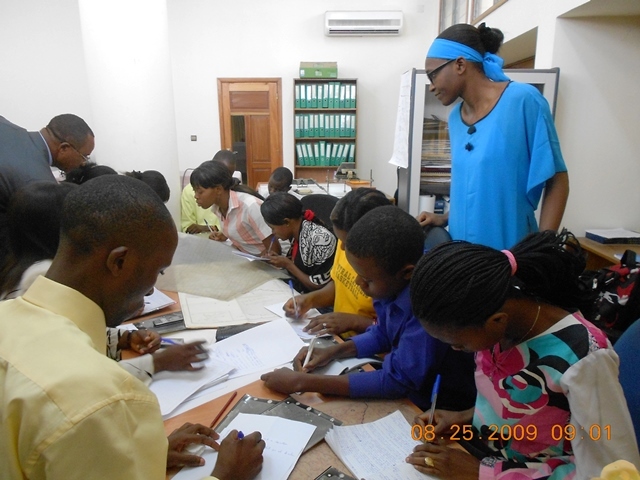 OSFAC has two (2) laboratories: A GIS Laboratory in the Faculty of Agricultural Sciences at the University of Kinshasa and a Laboratory of Remote Sensing 14 avenue Sergent Moke, Socimat, Ngaliema Kinshasa. However, OSFAC's trainers often travel to deliver training sessions on site, that is to say, in the place of the institutions or organizations that request. OSFAC employs full-time experienced trainers in GIS and Remote Sensing and receives technical support from partner universities (University of Maryland, State University of South Dakota). OSFAC has modern equipment consisting of desktop, servers, plotters, multifunction printers, GPS, etc.. The duration of training is determined by OSFAC, depending on the experience level of the trainees and / or ability required. Generally extends the duration of 3 to 5 days training per level. Comprehensive training (core modules to advanced modules) can spread up to four (4) weeks. The training takes place in both laboratories of OSFAC or in the location of the organization and the trainers are willing to provide training in any country in the Congo Basin. OSFAC organizes training sessions for 5-15 participants in general. For specific information, please contact the main Assistant in charge of OSFAC 's training. After receiving the demand for training, OSFAC treats records of each participant or institution then confirms the course of the training. The training will take place if the minimum number of 5 participants is reached. It will then ask participants to pay the full cost of training to confirm their place. Read the terms and conditions of training.